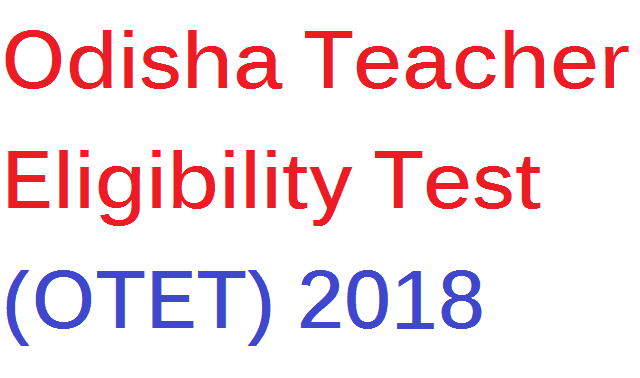 Orissa Teacher Eligibility Test (OTET) 2018 organized by the state government of Odisha. The candidates can check the details below this post about OTET 2018 such as OTET 2018 Application Form, OTET 2018 Exam Date, OTET 2018 Eligibility, OTET 2018 Admit Card, OTET 2018 Result and OTET 2018 Syllabus. The OTET 2018-19 state level examination for a choice of Primary and Upper Primary level Teachers in the state. Department of Education, Orissa conducted this OTET test each year. 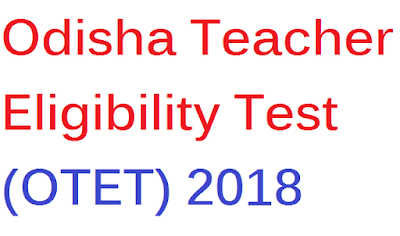 Orissa Teacher Eligibility Test (OTET) 2018, the Department of Education, Orissa has published the OTET online application form from 12th November to 27th November 2018. The candidates who try to apply for the OTET 2018 examination have to apply online on the official website bseodisha.ac.in. Candidates need to apply for OTET 2018 before the due date. No OTET 2018 application will be accepted by the Orissa Teacher Eligibility Test (OTET) conducting authority after the due date. Online Form Application Fee can be paid through online mode or offline mode. The applicants who need to apply for Class I to V i.e paper I likely passed +2 (Plus Two) standard from respective Board of Odisha, must have Diploma in Elementary Education. Applicant ought to be secured no less than 50 percent mark for general class and reservation classification will be given 5% relaxation. The applicants who need to apply for Class VI to VIII i.e paper II must be passed Graduation from respective University and must be cleared B.Ed or must have complete Diploma in Elementary Education in which Candidate ought to be possessed no less than 50 percent mark for the general classification and reservation class will be given 5% relaxation. For OTET 2018 application fee please see official notification and candidate can pay the application charge through E-Challan. 1. The online application form will be available in October 2018. 2. Candidates should visit the official site for an application form. 3. The application form must fill all details correctly online mode. 5. Candidate can pay application fees by E-Challan. 6. Finally, take a printout of confirmation copy and keep a printed copy for future reference. The Admit card for OTET 2018 Examination will available by OTET authority before 10-15 days. Candidates can download Admit Card of OTET 2018 by visiting the official site and by entering Registration No or date of birth or both. The OTET Result 2018 will be available on the official site. Candidates can watch their OTET Result 2018 result and can download a copy of result from the official site. Note: Before applying for OTET 2018, please visit the official site and read the official notice carefully. Please share this post with your friends and keep visit regularly for more updates.